Simply put, scars are the expected result of wound healing. Unless your injury is very superficial (a light scratch on the surface of the skin, for example) you should expect scarring to occur as part of your skin's natural healing process. So to help fade your scars, Dermefface FX7™ Scar Reduction Therapy has been formulated to normalize production of the skin healing collagen (type III) and skin strengthening collagen (type I). 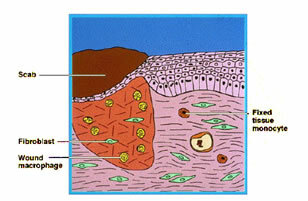 Old scarred cells are pushed to the surface and sloughed away through your skin's natural 28-day cycle of regeneration. And healthy, normal skin cells start to become visible – noticeably fading your scars! Hemostasis... Blood clots to seal the wound. 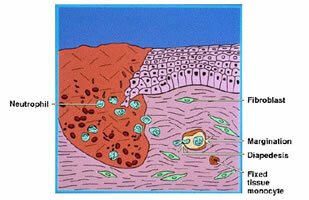 Inflammation... Bacteria, foreign particles, and damaged cells are removed from the wound. Proliferation... 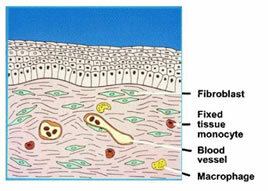 Skin cells multiply and spread, covering the wound. Remodeling... The new collagen matrix becomes cross linked and organized. 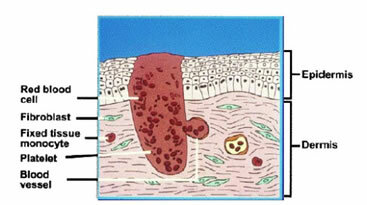 Obviously, this explanation of wound healing has been greatly simplified. ... Which means it's important to begin applying Dermefface FX7™ to scars as soon after the injury as possible for best results. Because while Dermefface FX7™ does work to reduce the appearance of older scars, it produces the most dramatic results on scars that have not fully matured. Plus, it can help you achieve a superior level of healing that your skin might not otherwise reach due to personal health issues or genetics. Perhaps you're wondering why healed skin doesn't just look 'normal' – like the rest of your skin? Why do these ghastly white, red, and/or purple scars appear instead? Think of it like emergency repairs during a storm. Windows have just been blown out of your home by hurricane force winds. Do you (a.) spend 2 weeks choosing new, custom windows with fresh blinds and curtains? Or, do you (b.) race to nail some plywood to the windows to keep the blowing rain and wind out? If you're like most sane folks, you'd likely perform some emergency repairs! And your skin 'thinks' much the same way. It's more efficient for skin, as it finishes the proliferation phase with type III collagen, to lay down the stronger type I collagen, linked along tension lines (instead of being randomly cross linked like your 'normal' skin). So the scar takes on a uniform appearance that makes it stand out from the rest of your skin. And your scarred skin has poor barrier function, which makes it susceptible to further damage and reduced healing due to free radical activity. And the increased free radical damage contributes to skin aging in the area surrounding the scar! But it's the best your skin is able to accomplish without the extra healing support available with the scar-fading technology of Dermefface FX7™. Boost Your Skin's Natural Healing Capacity To Fade Scars! Even once your injury appears to have healed, your skin is busy below the surface 'remodeling' your skin. And depending on the size and depth of the injury, this remodeling phase can take up to 2 years! Wondering If Dermefface FX7™ Can Reduce YOUR Scars? Without a doubt, the most dramatic scar-fading results with Dermefface FX7™ may be seen on scars that have not fully matured (i.e. that haven't completed Phase IV – Remodeling). However, because it has been formulated to include a series of ingredients that deeply penetrate scars and boost the production of both Type I and Type III collagen on every layer of your skin, Dermefface FX7™ does also work to significantly fade older, matured scars.